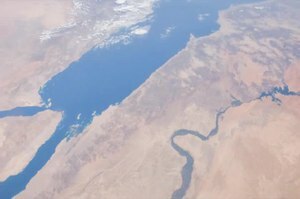 This video over the south-eastern Mediterranean Sea and down the coastline of the Red Sea was taken by the crew of Expedition 29 on board the International Space Station. Red Sea (jiske Arabian Gulf ke naam se bhi jaana jaae hae, or Gulf of Arabia) Indian Ocean ke ek seawater inlet hae jon ki Africa aur Asia ke biich me hae. Iske southe me Gulf of Aden aur north me Sinai Peninsula, Gulf of Aqaba aur Gulf of Suez hae, jisse Suez Canal jaawa jaae hae. ↑ Michael D. Oblath (2004). The Exodus itinerary sites: their locations from the perspective of the biblical sources. Peter Lang. pp. 53. ISBN 9780820467160. http://books.google.com/?id=c5ya9QVCpIkC&pg=PA53&dq=Red+sea+as+Arabian+gulf#v=onepage&q=Red%20sea%20as%20Arabian%20gulf&f=false. Ii panna ke 6 April 2015, ke 16:28 baje, pichhla time badla gais rahaa.